Cr�me br�l�e is a dessert worth investing in special equipment for. When one has good utensils to work with, cr�me br�l�e is one of the simplest desserts to make. The special equipment for preparing cr�me br�l�e is discussed on this page, such as a cooking torch or a branding iron salamander, ramekins, a hot water bath. You'll also need a saucepan or a glass bowl, a whisk and a strainer. Click here to know how to use these utensils and here for more information about the ingredients of cr�me br�l�e. A convenient culinary torch is essential for caramelizing the crunchy top. The cooking torches of today provide a simple way to enjoy this crowd pleasing treat. It will give you results that are exceptional instead of just acceptable. The ideal is to caramelize the top of the cr�me br�l�e without heating up the custard filling below, and a special torch accomplishes just that. Even when you're not making cr�me br�l�e, there's a large number of other uses for a cooking torch in the kitchen: browning meringues, melting cheese atop onion soup, quick-roasting peppers and tomatoes and so on. 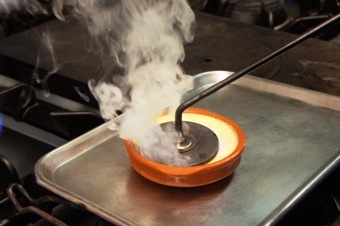 A good cooking torch has a safety lock, a removable stand, an adjustable flame, and is easy to fill. 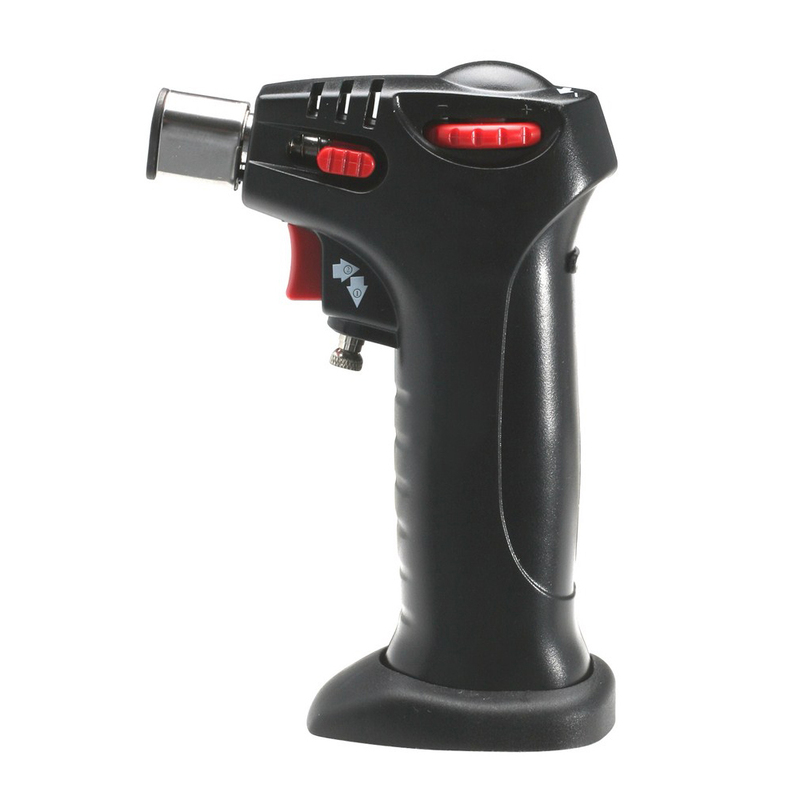 Butane fuel can be purchased in small cans that insert in the bottom of the torch for easy fueling. To ensure perfect baking, invest in ramekins of the right size. 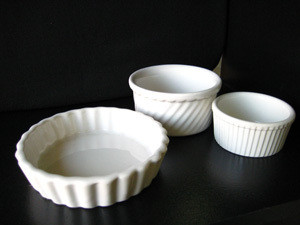 To make most of the basic, 4-serving recipes on this website, a set of four (4-ounce) ramekins is needed. Those with a shallow design cook quickly and evenly. For larger parties, you'll want two or more sets. 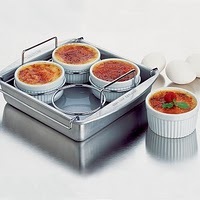 For certain specialty cr�me br�l�e, deeper ramekins or custard cups will give better results. The hot water bath provides a gentle, even distribution of heat so the filling cooks uniformly and keeps the smoothest possible texture. Increased humidity from the bath also helps to prevent a thick skin from forming on the surface of the creamy custard. Sometimes referred to as the French "bain-marie" it is made with a baking dish large enough to hold all of your ramekins. 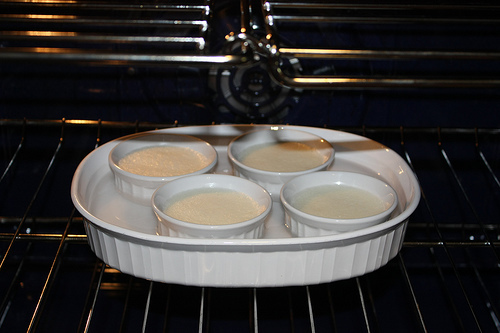 When the filling is ready to be baked, place the ramekins in the baking dish, fill them with the custard mixture, and then carefully pour very hot tap water or boiling water into the dish around them so that it comes about half way up their sides. Some people prefer to place the bain-marie on the oven rack before pouring in the hot water. When placing the hot water bath in the oven and when taking it out, it is important to move slowly and carefully so as not to slosh water into the custard. 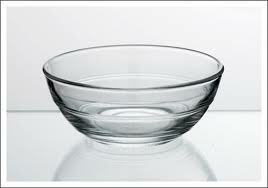 A dish with handles can provide more stability and makes carrying easier. For the purpose of heating cream and melting chocolate use a fairly heavy saucepan to minimize the possibility of scorching. 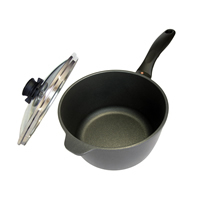 Choose non-stick cookware, if possible. Glass measuring cups and bowls can be useful as well, because they can be used to heat cream and melt chocolate in the microwave and have the added advantage of pouring well when filling the ramekins. 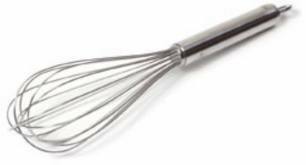 Use a small whisk for the cr�me br�l�e when blending the egg yolks with the other ingredients. 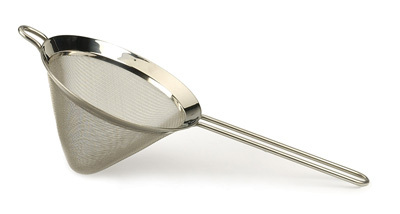 With a fine strainer you can remove spices, fruit pulp, and bits of coagulated egg, to make a smooth custard for your cr�me br�l�e.